Going Halal usually revolves around facing and solving two dilemma's : a dilemma of trust and a dilemma knowledge. The dilemma of trust mainly plays at the consumer's end : how can consumers be sure something genuinly is Halal ? And how was the Halal integrity maintained ? Especially with modern complex international supply chains ? Easy questions, but not always easy answers. Producers are facing both dilemma's : they have to earn trust from their consumers, but often they are not sure themselves what this consumer actualy wants. This lack of knowledge makes it difficult to know what to assure, how to assure it and how to convey Halal trust to the final consumer. 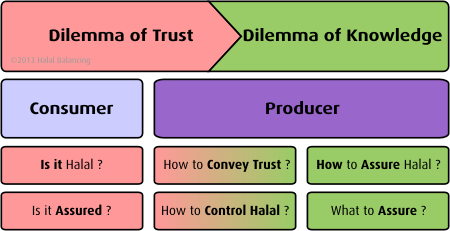 developed a a series of programs to solve these two dilemma's, starting from transferring knowledge to know what is to be assured, over building-in Halal into standard operational procedures to ensure Halal integrity, allowing trust to be transferred from the producer to the consumer through adapted and well designed communication programs. Existing Quality Management Systems, capable of maintaining product integrity throughout the entire supply chain, are leveraged by introducing genuine Halal requirements into the sustem. 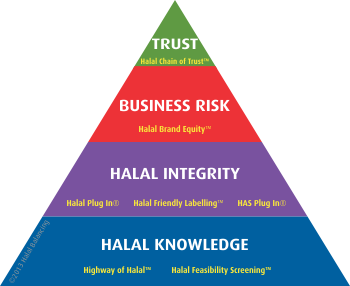 Halal integrity risks are determined using an adapted Jakim (Malaysia) approved methodology. Effectively combining Malaysian Halal Authority with European Operational Excellence. - balancing different requirements. Without compromising Halal Integrity. Halal for non-Halal environments.